Editors Note: A video and photo are included with this press release. 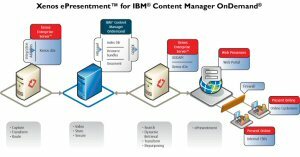 Xenos Group Inc. (TSX:XNS) today announced Xenos ePresentment(TM) for IBM(R) Content Manager OnDemand (CMOD), the latest addition to the suite of Xenos solutions that complement IBM Enterprise Content Management (ECM) software. Xenos ePresentment is a fully integrated online solution that provides a central interface for IBM CMOD to control the load and retrieval of business-critical content - such as customer bank, credit card or brokerage statements and insurance declaration documents - generated in high-volume print stream and image formats. Xenos ePresentment simplifies the integration between corporate portals, web presences, and the IBM CMOD archive. It captures, transforms, indexes and packages a wide variety of print stream formats for loading IBM CMOD via its ARSLOAD utility. On the retrieve side, Xenos ePresentment integrates seamlessly with the IBM CMOD OnDemand Web Enablement Kit (ODWEK) interface to provide document search, hit list display, transformation on-the-fly and document presentment functionality. - Reduce document archive storage costs when used in combination with the Xenos DSR(TM) (Document Storage Reduction) solution. "Today customers, partners and internal stakeholders demand web access to accurate, timely, and pertinent business information," said Stuart Butts, Chairman and CEO, Xenos Group Inc. "Driven by competitive pressure to continually improve the customer experience, organizations are moving rapidly to an online model for customer interaction. For companies using IBM CMOD, this solution enables seamless online information access. Customer service representatives can now see the same information as clients and react promptly to in-person or telephone service requests. This provides a marked competitive advantage and can dramatically reduce operational costs." - Xenos Loader(TM) for IBM FileNet P8 platform and IBM CMOD: Imports high volumes of print stream documents, images and associated metadata seamlessly into IBM FileNet P8 and/or IBM CMOD. This offering enhances the value of an existing IBM FileNet P8 implementation by logically breaking up high volumes of stacked files into individual document objects. It transforms formats as required and can extract additional indexing information directly from the content during processing. - Xenos DSR(TM) - Document Storage Reduction for ECM: Dramatically reduces the amount of physical storage consumed by high-volume documents retained within corporate archives and repositories. The solution intelligently separates and stores duplicate print and composition resources from the unique transactional content found within a high-volume document batch. The Xenos suite of solutions is built on the Xenos Enterprise Server(TM) (Xenos ES) component-based Java architecture. Xenos ES resolves the challenge of rationalizing business information architecture and flow for both structured and unstructured data by streamlining enterprise information supply chains, making information available where, when and how it is needed. Xenos ePresentment is available immediately. For pricing information, contact Xenos directly at sales@xenos.com, 1-888-242-0692. To view the accompanying video, please visit the following link: www.youtube.com/watch?v=H90oGxbKCps. To view the accompanying photo, please visit the following link: http://www.marketwire.com/library/20090601-Xeno800.jpg.